The treble winners were held to a 0-0 draw at Parkhead. Rodgers and his players at full-time. CELTIC SAW THEIR lead at the top of the Scottish Premiership table cut to nine points after they could only manage a 0-0 draw at home to St Johnstone. Three days after an excellent 1-0 victory over Zenit St Petersburg in the first leg of their Europa League last-32 tie, the Hoops were involved in a frustrating stalemate against dogged opposition at Parkhead. 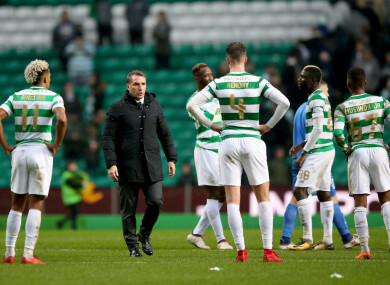 Hoops boss Brendan Rodgers made seven changes to the side that overcame the Russian outfit, with last year’s PFA Player of the Year Scott Sinclair and Australian playmaker Tom Rogic returning along with Cristian Gamboa, Charly Musonda, Calvin Miller, Odsonne Eduoard and Jack Hendry. St Johnstone goalkeeper Alan Mannus, who spent two years with Shamrock Rovers, was equal to two attempts by Musonda, while also saving from Sinclair during the first half. Northern Ireland international Mannus was busy again after the break, keeping Celtic at bay on several occasions to earn the Saints a hard-fought point and edge them further away from the relegation zone in ninth. Dubliner David McMillan, who joined St Johnstone from Dundalk in December, missed out with a knee injury. Rangers, meanwhile, sit second in the table — level on points with Aberdeen — after a 5-3 win away to Hamilton Academical. Rodgers now turns his attention back to Europe for Thursday’s return leg in St Petersburg. Email “Ex-Shamrock Rovers keeper on form as below-par Celtic drop points against dogged St Johnstone ”. Feedback on “Ex-Shamrock Rovers keeper on form as below-par Celtic drop points against dogged St Johnstone ”.